We continue with some of the “below of the radar” Rai smiths. I have mentioned another son of Kunitoshi in the previous chapter, the homonymous Kunitoshi (国歳), but hardly anything is known on this smith and I am not aware of any extant blades of him. The Kotô Meizukushi Taizen however says that he was born in Kenji two (建治, 1276) and that he died in Genkô one (元弘, 1331) at the age of 55. Consulting the traditional genealogies, it seems that the lineage of Rai Kunimitsu did not bring forth many independent smiths. Or in other words, it is safe to assume that he trained many students but who remained working as assistants throughout their entire career and did not have an output of blade on their own account. Well, we find a certain Rai Kuniyoshi (来国吉) listed as son of Kunimitsu who was supposedly active around Ôan (応安, 1368-1375) but no blades of him are known either. This brings us the the next Rai lineage, namely that of Kunitsugu. He had a son, Rai Kunihide (来国秀), who was born in the first year of Kôan (弘安, 1278) and who died in Kôei one (康永, 1342) at the age of 65, so the Kotô Meizukushi Taizen. There are a few signed yari extant of Kunihide and one niji-mei tachi that got jûyô. Incidentally, there are 7 works of Rai Kunihide that passed jûyô but none that bears a designation by the Agency for Cultural Affairs. Asigned tachi of Kunihide is shown in picture 1. It has a wide mihaba, a shallow sori, and an elongated chû-kissaki, what speaks for a sugata from the very end of the Kamakura to the early Nanbokuchô period. The kitae is a dense itame with ji-nie and chikei and the hamon is a nie-laden gunome with a wide nioiguchi that is mixed with chôji, many ashi, and some few sunagashi and kinsuji. The bôshi is midare-komi with a very brief ko-maru-kaeri. 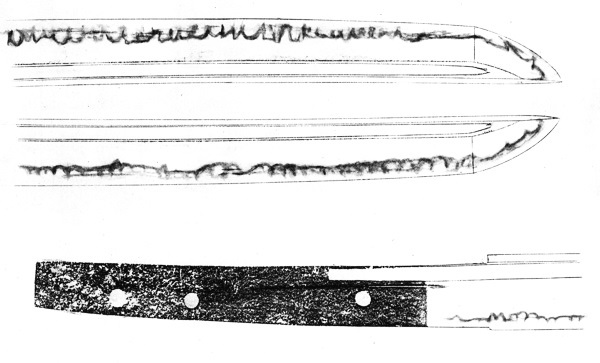 Both sides show a bôhi with ryô-chiri and a kakudome in the tang and traces of a soebi. The tang is suriage, has a kirijiri, kiri-yasurime, and bears a thinly chiseled niji-mei. Now interesting is that this tachi is not signed with the prefix “Rai” but the blade is nevertheless attributed to Rai Kunihide. In the jûyô description we also read that because of the kitae with chikei and the nie-deki hamon in gunome mixed with chôji and the midare in the bôshi, the workmanship resembles closely that of Rai Kunitsugu, his alleged father. It is interesting that seemingly neither signed nor unsigned tantô or hira-zukuri ko-wakizashi of Rai Kunihide going round. Thus I want to introduce another tachi of him before referring to his yari. 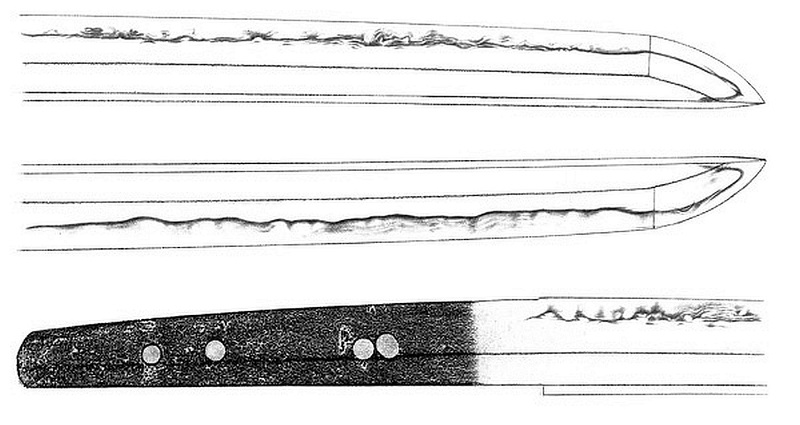 The tachi (which is now a katana) shown in picture 2 is relative wide and has a slightly elongated chû-kissaki, what again brings us in the same time of end of Kamakura to early Nanbokuchô. The kitae is an overall somewhat standing-out itame that is mixed with mokume and much nagare on the omote side and also chikei and plenty of ji-nie appear. The hamon is a nie-laden suguha-chô to shallow notare that features a wide and bright nioiguchi and that is mixed with gunome, chôji, ko-chôji, thick and long ashi, yô, sunagashi, kinsuji, uchinoke, and smallish yubashiri which all focus pretty much on the habuchi (i.e. don’t spill much into the ji). The bôshi is sugu with a ko-maru-kaeri and some hakikake. So again, the workmanship suggests Rai Kunitsugu at a glance but once more, the NBTHK plays the quality card and says the overall quality is just a hint under that of Kunitsugu but the work is clearly from the direct vicinity of Kunitsugu and as the quality is very close, they go for the smiths who ranks very next, and that is his alleged son Kunihide. Now in picture 3 we see one of his extant signed yari. It is with a nagasa of 11.0 cm a smallish yari and shows a finely forged ko-itame with plenty of ji-nie and a noticeable tendency to masame. 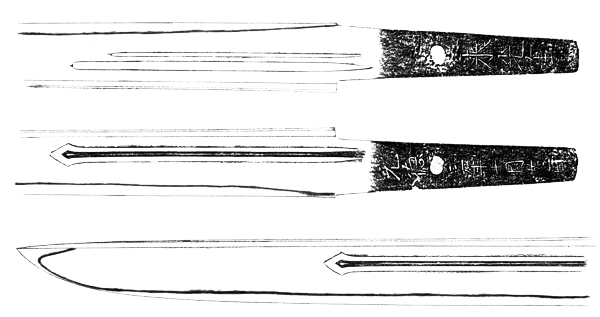 This appearance of much masame is also true for his other yari and goes most likely back to the different forging techniques used for yari (which are for example also evident on ken). 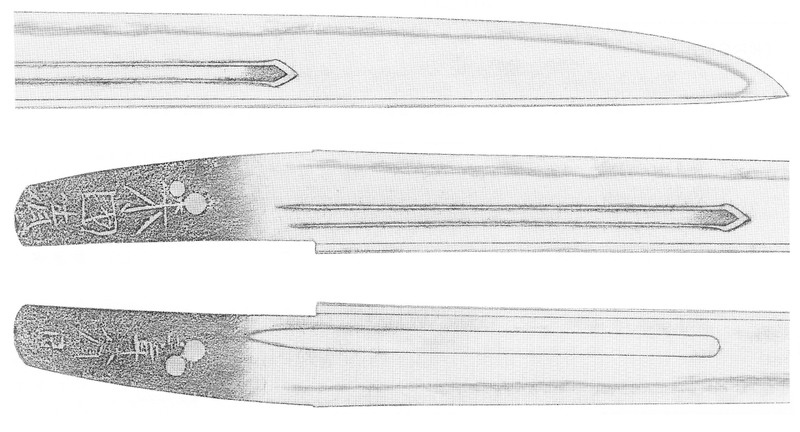 The hamon is a slightly undulating suguha-chô in ko-nie-deki. Another smith who came from the lineage of Kunitsugu was Rai Hidetsugu (来秀次). He is listed as son or student of Kunitsugu but also as son of Kunihide whereas some put all them all in a pot and say that Kunihide and Hidetsugu were the same smith who succeeded later as 2nd generation Rai Kunitsugu. This would mean that Kunihide changed his name at some point in his career to Hidetsugu or vice versa. The meikan list Hidetsugu a little later than Kunihide, i.e. around Jôji (貞治, 1362-1368), and the Kotô Meizukushi Taizen says that he was born in Enkyô two (延慶, 1309) and that he died in Jôji six (1367) at the age of 58. Well, as the signature style of Kunihide and Hidetsugu is quite different, I would keep them all separated for the time being and dismiss the approach that we are facing here the same smith who succeeded later as 2nd generation Rai Kunitsugu. Interesting is that unlike Kunihide, there are just tantô and no long swords of Hidetsugu extant. Also no hira-zukuri ko-wakizashi of this smith are extant as far as I know. So let’s take a look at one of his tantô (picture 4). It measures 27.9 cm in nagasa, has an uchizori, and shows an itame-nagare with shirake. The hamon is a nie-laden ko-notare with sunagashi and some kinsuji and yubashiri and the bôshi is notare-komi with a ko-maru-kaeri and a hint of hakikake. In the Nihontô Kôza, Honma states that this tantô fits well into the lineage of Rai Kunitsugu but earlier in his Nihon Kotô Shi he said that “There are two tantô with the signature of ‘Rai Hidetsugu’ existing and their hamon is midareba, but their workmanship is totally different from that of Rai Kunitsugu.” The other tantô, which is briefly presented in the Nihontô Kôza and shown here in picture 5, is of different interpretation, i.e. it is even more nie-laden and hardened in gunome-chô, and shows clearly a different signature style. Well, Honma says that if viewed each by its own, he would say that they are authentic but in comparison, he is not sure if one is gimei (or both) or not or if one goes back to the hand of a second generatio Hidetsugu. So this is something for further study but I am not aware of any other signed Rai Hidetsugu blade popping up in the meanwhile and there is also none that passed jûyô so far. But maybe this discrepancy has to be seen in view of what Honma suggests, namely that at around this time, the Rai School had already lost their traditional workmanship and things becoming washy. Picture 5: The other known tantô of Rai Hidetsugu as a reference. On the other hand, there were still some late Rai smiths who tried to keep up the tradition of the school. For example, there was a tantô discovered about 15 years ago that is signed “Rai Kunikiyo” (来国清) and dated “Meitoku yonnen hachigatsu hi” (明徳二二年八月日, “a day in the eighth month Meitoku four ”). Now this Rai Kunikiyo is not listed in any meikan and the date of Meitoku four, i.e. at the very end of the Nanbokuchô period, makes this tantô one of the very last Rai works known. It is rather wide, has a thin kasane, shows a hint of sori, and a dense ko-itame that is partially mixed with ô-hada. Also ji-nie and a faint utsuri appear. The hamon is a suguha in ko-nie-deki that features a wide nioiguchi and that is mixed with noticeably wide hotsure areas and some sunagashi. The bôshi is sugu with a ko-maru-kaeri and we see a suken on the omote, and a wide koshibi on the ura side. Not sure if the tang is a little suriage but the mei is thickly chiseled. The two characters for the nengô era are barey legible on the oshigata but the descriptio says that it is clearly Meitoku when examining the tang in hand. To conclude this chapter, I want to introduce the smith Rai Mitsushige (来光重) who is dated around Gentoku (元徳, 1329-1331) and who was a student of Rai Kunitoshi. Well, some speculate that Mitsushige was the early name of Rai Kunimitsu but the signature style differs too much as to follow this approach blindly. However, signed works of him are extremely rare so well, we can’t say for sure if there is some truth in this tradition. I for my self see them as two individual smiths for the time being. Now there is one signed tantô extant (see picture 7) that is also dated, namely “Gentoku sannen jûgatsu nijûninichi” (元徳三年十月廿二日, “22nd day of the tenth month Gentoku three ”). It is rather wide, has a little uchizori, and comes in a sunnobi-sugata. The kitae is a ko-itame with nagare and ji-nie and the hamon is a suguha in ko-nie-deki that shows nijûba along the monouchi. The bôshi narrows very much down along the fukura and runs widely back as ko-maru-kaeri. On the omote side we see a suken and on the ura a take-kurabe-style koshibi with soebi. The tang is ubu, has a kurijiri, shallow katte-sagari yasurime, and bears a rather largely chiseled mei.